"Jamie Does"...is Jamie's personal celebration of amazing food from six very different countries. Cheap, short-haul flights and long weekend getaways have become increasingly popular and within a few short hours of the UK there are new and exciting worlds of food waiting to be discovered as Jamie finds out. Each chapter focuses on a different city or region - Marrakesh, Athens, Venice, Andalucia, Stockholm and the Midi Pyrenees region of France. Classic recipes sit alongside new dishes that Jamie learns along the way. 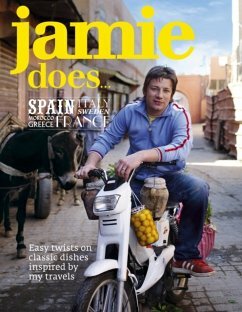 Alongside each recipe there is a beautiful photograph of the finished dish, as well as incredible reportage shots of Jamie's experiences in each country. Jamie says: 'The food I've embraced on each trip is a mixture of what you could call the cliched star dishes - the many tagines of Morocco, the flamboyant paellas of Spain, the comforting risottos from Italy and the zingy fresh flavours of a classic Greek salad - and the recipes that I've been inspired to make after walking through the markets and soaking up the vibes of each place. What you'll find in this book is fun, optimistic, escapist food you can actually cook and enjoy in your own home. 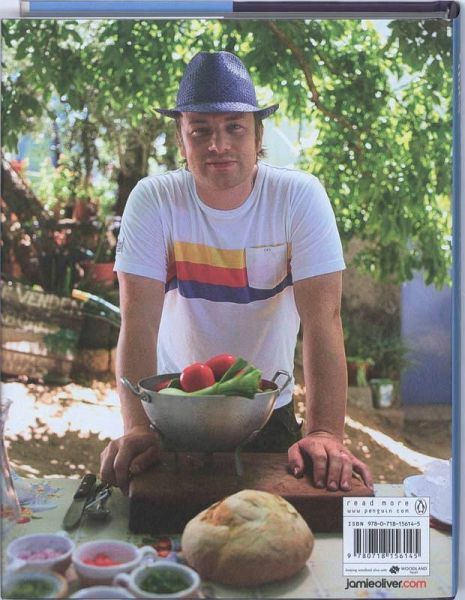 Jamie Oliver is a global phenomenon in food and campaigning. During a 19-year television and publishing career he has inspired millions of people to enjoy cooking from scratch and eating fresh, delicious food. Through his organization, Jamie is leading the charge on a global food revolution, aiming to reduce childhood obesity and improve everyone's health and happiness through food. Jamie started cooking at his parents' pub, The Cricketers, in Clavering, Essex, at the age of eight. After leaving school he began a career as a chef that took him to the River Café, where he was famously spotted by a television production company and the Naked Chef was born. He has now published 20 bestselling cookery books, all with accompanying TV shows. Jamie lives in London and Essex with his wife Jools and their children.